In November 2015 we were introduced to a client with a split level site, part existing raised concrete base and part lawn area, with significant left to right fall of nearly half a meter. The clients provided a design brief for a garden room gym, with two defined internal areas, one as a traditional gym with heavy equipment and the other with enough interior head height to enjoy their hobby of yoga. 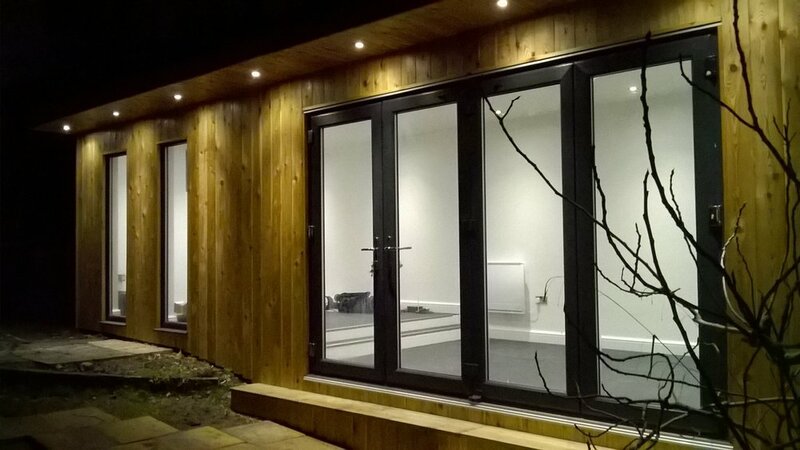 The garden room install was to comply with the 2.5m permitted development height limit, to avoid the need for a planning application. On surveying the site we found an existing shed, sitting on a concrete base which was in use as a home yoga space. The site also had a lawn area to the right, showing significant left to right fall of nearly half a meter. 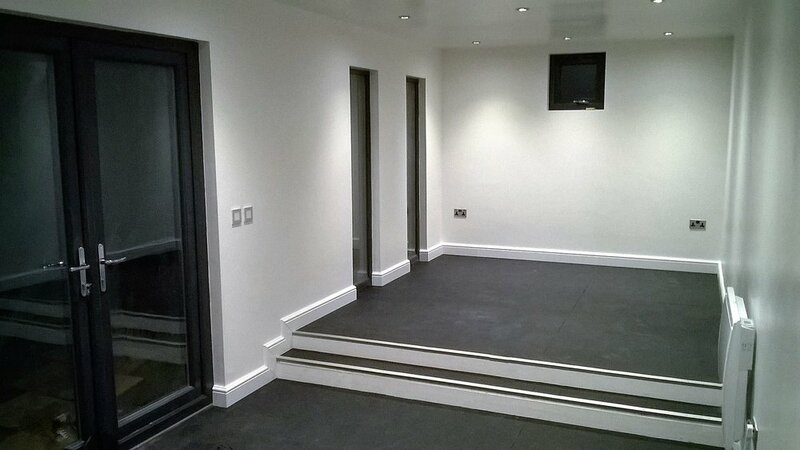 After discussing the detailed requirements for our potential new client's space, we understood that there was a need for two distinct areas, one would house heavy gym equipment the other would be an area for yoga activities requiring an interior head height of 2.5m for stretches and jumps. 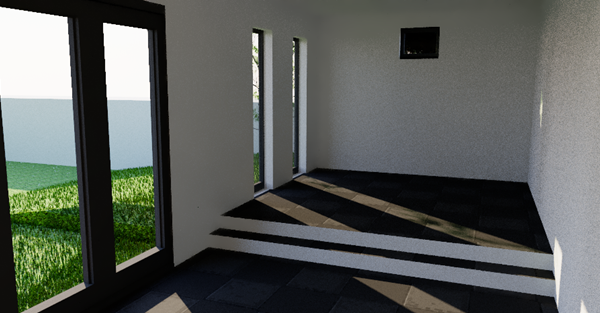 Both areas should feature floor to ceiling glazing and the new garden room should fill the full width of the garden. 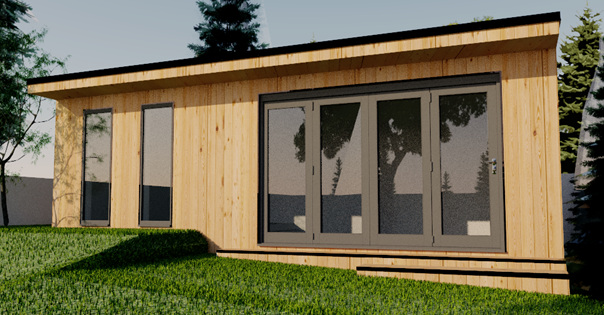 The client also indicated that they would like the garden room installed under their permitted development rights, avoiding the need for a planning application, this meant that there would be a 2.5m external height limit. So an interior height requirement of 2.5m for the yoga area and an outer permitted development height limit of 2.5m! The first challenge was to find a solution to the 2.5m internal head height for the yoga area and also achieve an external height in line with the 2.5m permitted development limit. The external permitted development height limit is measured from the highest natural ground point around the structure to the highest point on the building. Meaning that as long as you can measure under 2.5m from the top of the building to the ground at one point around the garden room, the rest of the structure can measure great than 2.5m where the ground falls away. So as a solution we proposed a stepped level garden room design. The area to the left would sit on the existing concrete base, the external height would measure 2.5m to the ground and therefore comply with the permitted development height limit. This area would house the heavy gym equipment and feature two full height windows and a high level opening ventilation window to provide purging ventilation during workouts. The connected right-hand side of the garden room would step down following the fall of the ground, to an area with an internal height of 2.5m and an external height of 3m. This area would sit on our concrete plinth foundation system, together with our uprated floor system for gyms. Externally steps would be added to allow access to the garden room through a 3.3m bi-folding door. The complete internal area would be finished with heavy-duty rubber floor tiles, suited to the intended use of the new space. We were pleased to hear the news that our clients had accepted the proposal and a few weeks later work began. 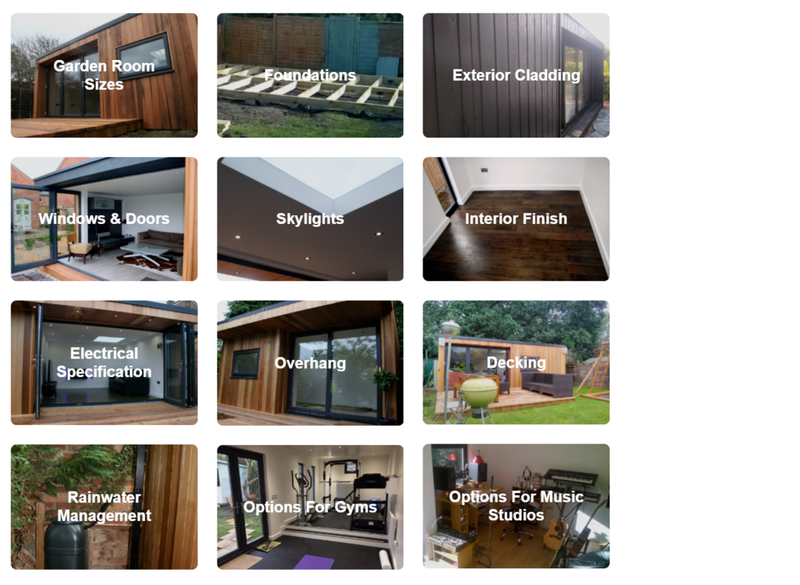 With this build we took on the challenges of the design brief and managed the difficulties of a split level site, using two different foundation methods to deliver the usable space our client wanted. This project challenged our design skills and flexibility, skills which are invaluable when it comes to managing difficult ground conditions such as these.